Now, you can see “The Long Garden Path” in context. All 160ft. of it! The obvious solution, which we’ve adopted, is to create a series of separate gardens or “rooms”. Let’s start at the top, by the house. 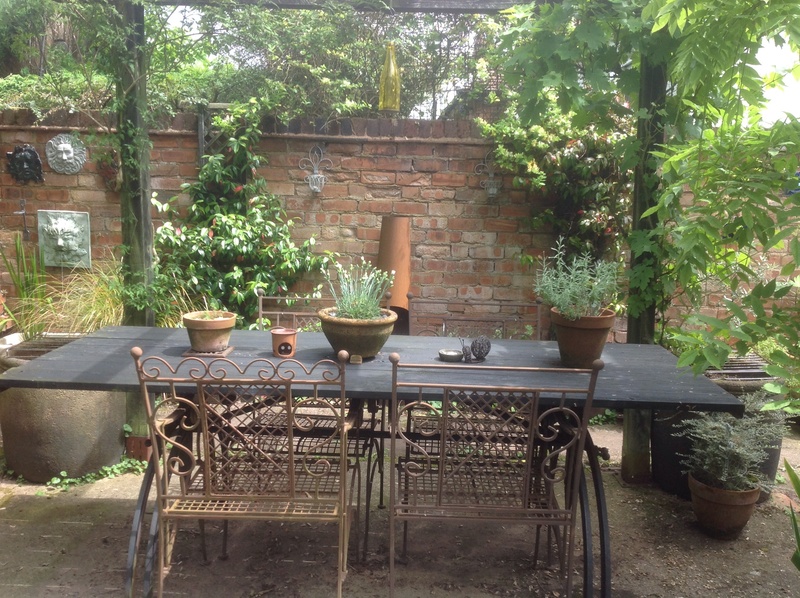 Our patio area, with a dining area under a pergola, clothed in scented climbers. A chiminea, flanked by more scented climbers, and lit by tealight holders, keeps us warm. Mediterranean plants and herbs in pots are grouped about. Adjacent to the pergola are two supposedly symmetrical herb beds, here, mainly the green herbs. The paved area continues, to “link” the courtyard to the Cottage Garden, leading past our brick built barbecue, and on to our seating area. It’s decorated here with blue glazed pots, filled with foliage. The garden opens out here, in the Cottage Garden surrounding a large lawn. 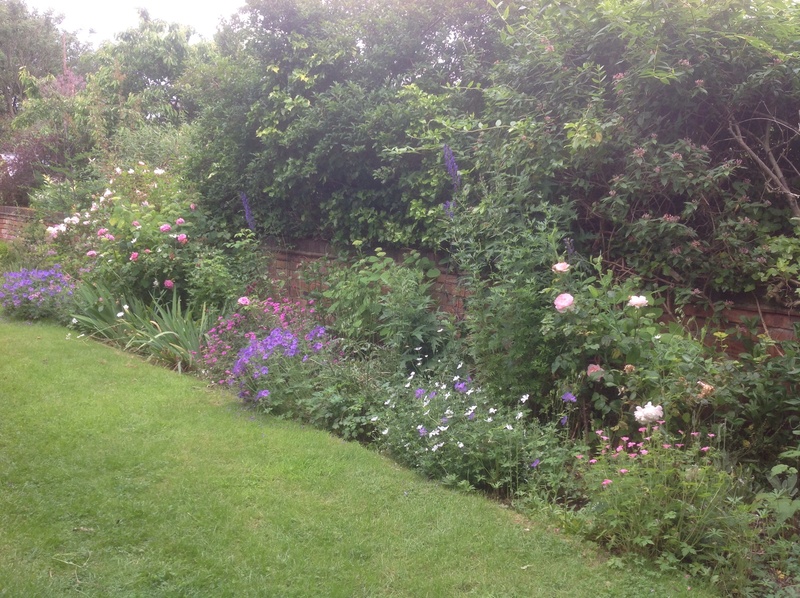 The Cottage Border flanks the brick wall here, with traditional cottage planting, including roses, all in pastel shades. On the opposite side, we’ve planted our Scented Shrub Border, hopefully providing scent all year round. You’re drawn on now, down “The Long Garden Path” by the first of our archways, which dissect it. You emerge into the sunshine here, and are faced with a large border, full of grasses and brightly coloured perennials. Shades of chocolate-orange, wine and gold. You can actually cut through the planting here, by way of a narrow gravel path which links to the concrete path which extends from here, the length of the garden, providing an alternative route round the garden. On the other side of the central path, is the shed and the “yard” – the necessary work area! You can now carry on through the next arch, and reach The Allotment. Well, the name says it all! It’s a simple layout, of two long beds on either side of the path, for veg. The right hand bed borders the concrete path by the wall, making the beds more accessible. We’ve edged this with a row of fruit cordons. Pots also line the path with blueberries, strawberries and an assortment of more tender veg. The left hand bed is narrower and shadier, due to the hedge, and we grow here, more permanent planting, such as rhubarb and artichokes. The woody herbs line the path, where the sun hits it. Then you reach the two soft fruit beds, with berries and currants, each surrounded by box hedges. Then on through the last arch. Here, mature trees create a very shady area, which is perfect for woodland planting, including shrubs and spring flowering bulbs and flowers. The interest is kept going with autumn colour, winter bark and stems, and, not forgetting, the all important scent. All paths must lead somewhere, and the “Long Garden Path” leads here. Turn around and you can see all the way back up to the house. 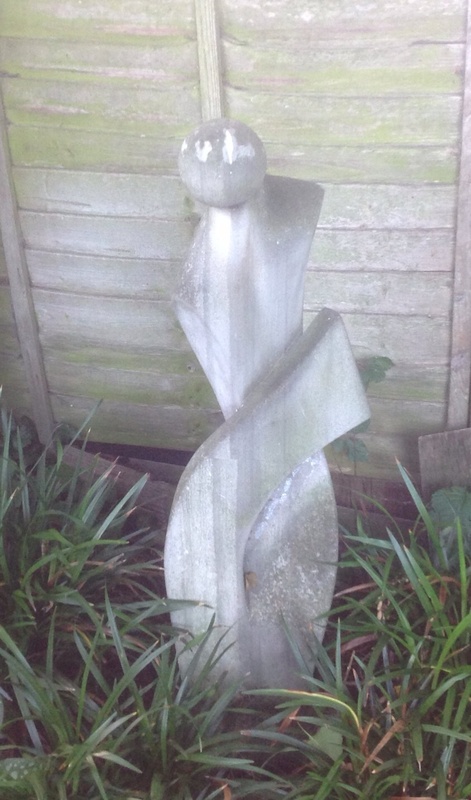 Paths need a focal point to draw the eye on, and so let me introduce “Kingsley”! So there it is! Welcome to my world! Hurrah, and thank you so much for doing this – it really helps to put things in perspective (even if looking at it for the first time at the end of August the eye is a little deceived as the photos are presumably not quite as recent!). I shall refer to this again and again – the grasses border and cottage borders look lovely, don’t they? 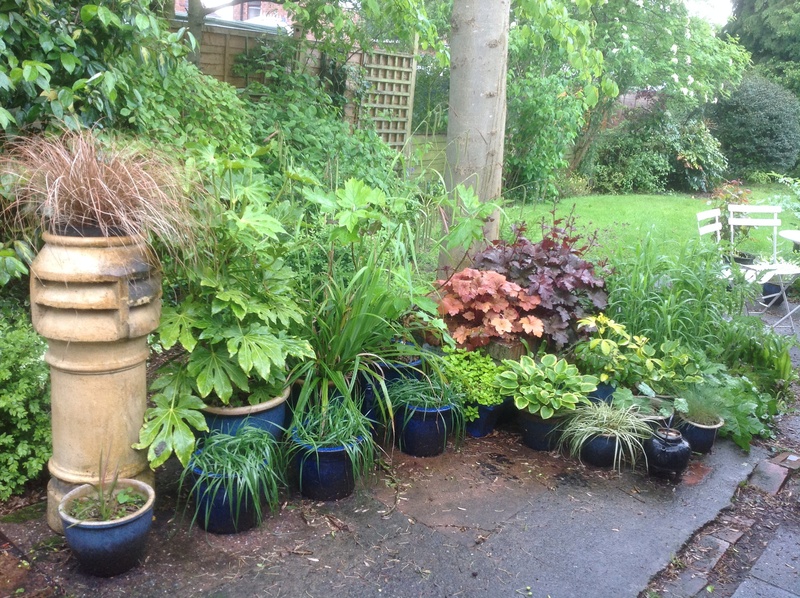 As do your foliage in pots, of course, AND your woodland border! Thank you so much, Cathy! I’m glad you liked it! That was my aim. The photos have been taken over a period of time, and chosen to show each garden at its best. 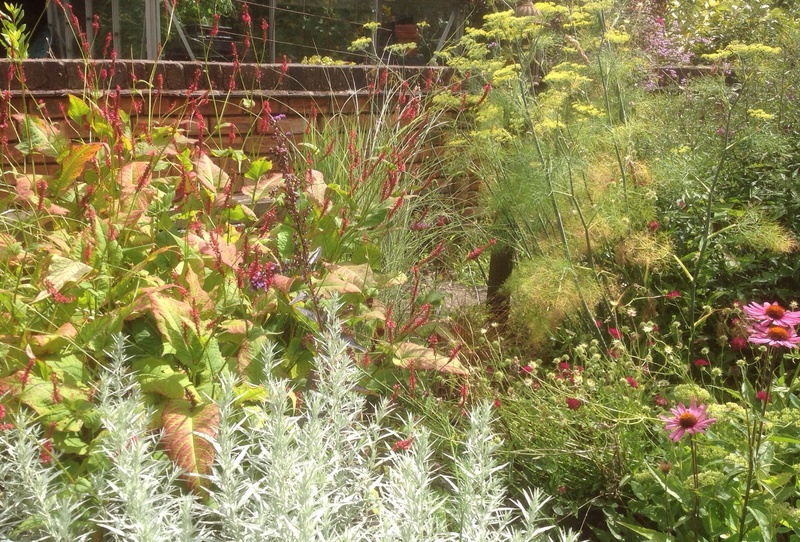 It should then, hopefully, show the highlights of the garden throughout the year. Cathy is so right – thanks, Ali, for sharing! It’s so helpful to get an idea of the wider scheme and not to see only little pics. Love your grasses border! Thank you, Annette! Glad you like it! 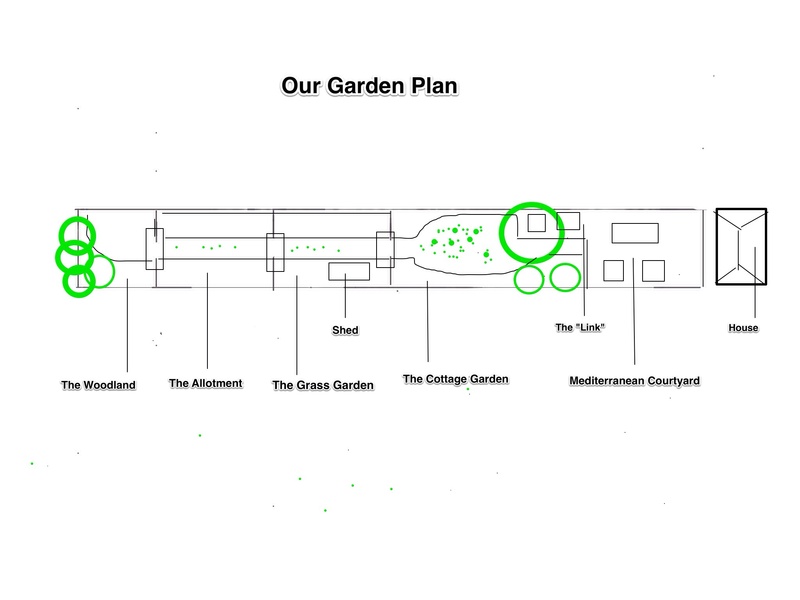 I always enjoy seeing plans when reading articles on gardens. It helps to put all the photos in context, and to see the bigger picture. So I thought I’d have a go myself! 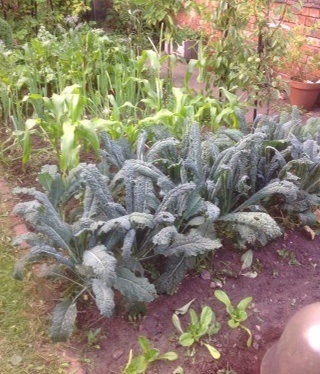 What a wonderful garden, full of everything from your patio to the allotment area. I am glad I’ve found your blog. Thank you, Ronnie, for your lovely comments! I must apologise – I’ve only just come to realise you commented on this post. So sorry, but I must say, I do appreciate your kind words! Thanks, Cynthia! So glad you like it! I’m so impatient that I tend not to look at plans – but yours, and the tour that followed, was great. What a terrific garden you have made in a narrow space. Aw, thank you, Cathy! So pleased you liked it! 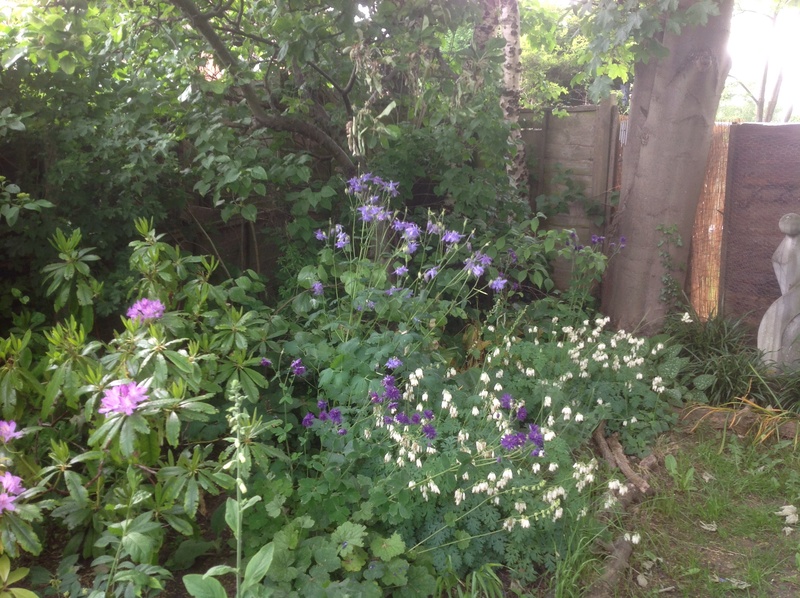 New to you, and SO glad I found your Blog, the map is invaluable, love your planting ideas. Thank you, Jackie! So nice of you to say so! Your garden is very simular in shape, size and design as ours.